Headed to Phoenix in the morning. Looking forward to some relaxation while I am there. I have just been informed by SCWA that the water is now drinkable in The Pines, Cherry Grove, Point o’ Woods and Ocean Bay Park. Happy Thanksgiving everyone, we have a lot to give thanks for this year. I will be in the Grove on Saturday once again performing post Sandy recovery work. This time there will be a crew to reinstall the fire alarm pull box stations that were damaged on Lewis from Aeon to Ivy when the utility pole snapped. Headed back to Fire Island tomorrow for more damage assessment. Going to be about 50 degrees so that will be a nice weekend for November. Have to come up with detailed damage assessment of our boardwalks and beach access points. Hopefully we will have some news about restoration of power to Cherry Grove soon. Stopped for the first time since Hurricane Sandy and got gas. Still had a bit above 1/4 of a tank. Waited about 10-15 minutes in line at Shell just over here at Hwy 17 and Franklin. Took a bit longer because the station was in the middle of shift change at 7am. But was fine. Now I have a full tank. Last night, our Syosset, Long Island facility had commercial power returned but now it is lightly snowing here in Teterboro as a new storm comes to visit. Thank goodness on the other side of this storm I hear it is going to be warmer. Everyone around here happy with the election results last night. And the fact that it did not drag on for days like the Gore/Bush mess in 2000. Obama reelected as President. The west coast pushed him over the Electoral College limit of 270 after Ohio was called for him. Ok, I can sleep. Have been a bit under the weather with all of the SANDY recovery work and just run down from all of the hours. Odd/even gas rationing now in effect in NJ. I had an odd number so I will not be able to fill up until Monday since the lines are terrible today. Rationing only went into effect at noon today. Hopefully that will help but this should all be a memory in a few days. I still have 1/2 a tank of gas. I received an email indicating the Chief and several others are headed out to Fire Island today (Saturday). I received it very late to make arrangements and I only have 1/2 tank of fuel which is a high demand item here right now that I do not need to be wasting just to see the island. Not sure there is much I could do at the fire house anyway. I think if fuel would not have been an issue, I might have gone. Maybe next weekend when more normalcy has returned. The fuel situation should resolve itself as panic buying goes down as more stations open with the return of the power. I have seen fuel tankers on the roads so I know supply is going out. They say that a large percentage of the fuel depot in this area are still without power. Thus even if a station has power, it might be high and dry with no product to see. Cherry Grove did very well when compared to the rest of Fire Island. Only 1 telephone pole damaged (as seen below). There was a fire in Ocean Beach yesterday but it was knocked down in 20 minutes and crews on scene kept it from getting out of hand and spreading. With little water in the mains it was difficult. Water has been returned to some communities on the west side of Fire Island but it is NOT APPROVED FOR DRINKING. I hear there is a new inlet on the east side of The Pines. The east access to Fire Island is now closed indefinitely. LIPA is almost done with their assessment of the communities and they are really happy with how well the island held up over all. They have finished their primary line inspection (that is the highest wire on the pole, the Primary line which powers the transformers) They are still working on the secondary inspection. Command has been established at the Kismet Fire House. There is no phone, internet and sketchy cellular service there. But a workable road in for those with appropriate ID. The bay and island is being patrolled by Coast Guard, NYS and Suffolk County police since Fire Island is off limits to anyone other than emergency personnel. The PUBLIC HAS NOT been authorized to return yet. Emergency crews must secure the areas of concern first. I hear from Jordan that all roads in Ocean Bay Park are now open except for one which has a house in the middle of it. Hmmm, good reason to not clear the road I guess. As many of you know, Bobby and Mark clear our walks after a snow storm so that if there is a fire, we can get equipment to the scene. Same principle. Other departments are doing the same thing by clearing sand and debris off of and out of the way so that roads are passable. It also helps the damage assessment people. Building inspectors have condemned many homes on the island (to my knowledge NONE in Cherry Grove). If you saw the raw footage of the island from News12 copper it was devastating to the east of us. Click Post-Sandy damage link. The last 10 minutes or so is Ocean Beach (look for the shot with the water tower to help get your bearings. The footage ends with Point o’ Woods but you get an idea on how bad things are to the west of us. I saw what I think was MARINE 1 flying over on Thursday as well. Loved the news conference of our Gov and the President. 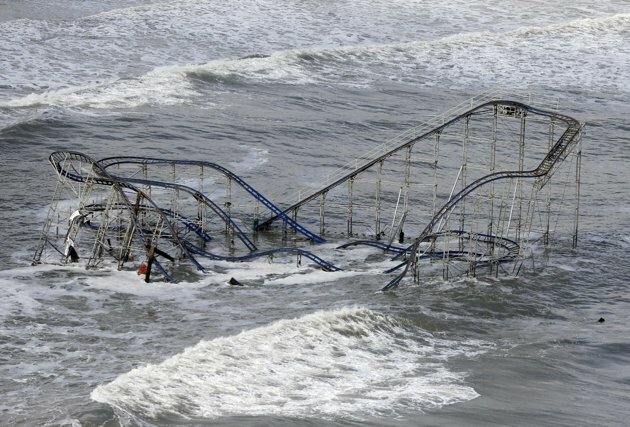 Anyone want to buy a cheap roller coaster down on the Jersey shore? Well, Jersey Ocean I guess now. Some of this is techie talk which we would understand only. Just skip over that part. This is an email my Director sent out to our entire Eastern Region team. 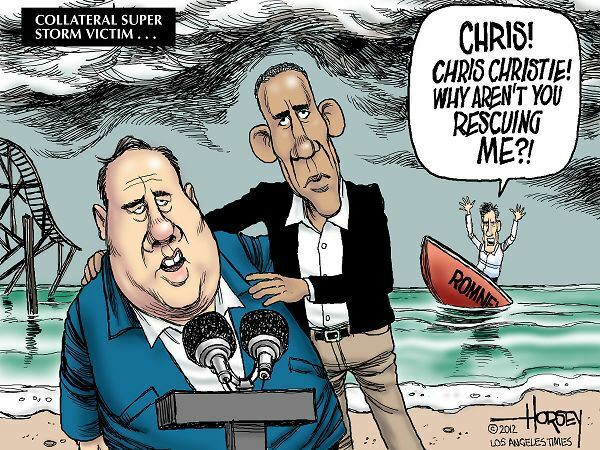 As I'm sure you are all aware, NY/NJ took the brunt of Hurricane/Superstorm Sandy. Early on the Teterboro business unit became an inaccessible island and shortly afterwards lost the generator that powered the LAN, WAN, PBX, Megasys, and CorHub. The situation was made even more complicated by 10 of 11 SLT members losing power to their homes. Field IT folks, as usual, stepped up and provided as much support as we could as emergency measures were put into place to get specimens to Syosset, get specimens to Wallingford, help scope out plans to bring up our Disaster Recovery site in Sterling Forrest, and in general just provide a conduit between the businesses themselves, and the business and the rest of IT. Our inherent knowledge of both the business operations and QuestLab, once again proved invaluable to both operations and corporate IT functions. While I am once again humbled and proud of all of your efforts, of particular note is the effort of our own Craig Williams. At time when the rest of Quest, both IT and Operations, was starving for any information at all about what was going on inside the actual facility, Craig managed to wade into the facility and establish real time communications between the outside world and the inside of the Teterboro building. Once Craig arrived in the building and established reliable, consistent, and informed communications with those of us on the outside, a true and focused recovery plan could be organized and orchestrated. Craig became a very public face to the services we provide to our business partners on daily basis, but highlighted in the time of crisis. I would like to publicly thank Craig for his outstanding representation of all of us during this disaster; his efforts truly were a game changer in re-establishing both a working QuestLab and a Teterboro building. Thanks to all of you who spent countless hours on the phone and onsite supporting our business and IT partners through this storm; once again proving what a valuable and reliable asset we our to Quest Diagnostics.